kinect – Welcome to Spinksville! If you have been following the gaming news, you probably know all about the Xbox Kinect already. Made up of a set of cameras that you attach to the console, it removes the need for an actual physical controller. Instead you can posture and dance around in front of the Xbox and Kinect recognises what you are doing. It also likes to embarrass you in public, and is the sort of smug device that informs you graphically that it isn’t just misinterpreting your baggy jumper, but can figure out exactly how fat (or thin) you are underneath. Thanks to a good friend with a new Kinect, I got a chance to go over and try one out last weekend. I was intrigued, but mildly dubious. I knew it was supposed to be good but there’s always an element of doubt until you see the thing working in person. First off, it is frankly quite an amazing device. The xbox has never had a nice controller so being able to ditch it completely was always going to be beneficial. But even just being able to control the device by waving and (possibly) shouting at it is a very different way to interact with technology. Kinect turned out to be very adept at picking out the various different players, all of different shapes, heights, etc. There is even a mode where it can show you how it has traced a skeleton for you, to prove that it really is tracking the arms and legs properly. The games themselves are a mixed bag, and it’s going to be an acquired taste. We tried one of the dance games that’s been well reviewed and I wasn’t all that excited by the whole thing. Dancing is cool, having a console that can track your moves and tell you when you’re doing it wrong is cool, but as a game it’s just not all that fun. It’s probably a great keep fit programme though. 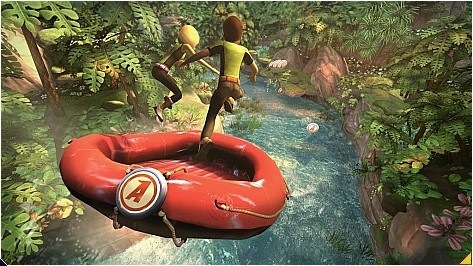 The game that really grabbed me though was the raft racing that came with Kinect Adventures. It’s in the screenshot at the top. It was intuitive in a way that I’ve just not experienced before in a computer game. As soon as you see the opening graphics with the first person view of the raft about to go down the water chute, you just know that you’re expected to act as though you’re balancing on that raft. You know that you’ll steer it by leaning in one direction or the other. When the raft goes up a ramp, you know you’ll be able to get more height by jumping when it reaches the top. And it works in exactly the way you’re expecting. The screen gives you all the feedback you need to adjust your stance, ‘steer’ through the obstacles, and collect the balloons by hitting your ramps full on. This is just the beginning. This type of game isn’t new (Horace goes Skiing goes back as far as 1982) but this way of controlling it is something you might only have associated previously with very expensive simulators. Now you just hook up a Kinect and can ski/ raft in your living room. Having seen it, I can’t wait to see what else devs can come up with. I think this type of controller really needs a very different approach to UI and game design so that it feels natural (like the rafting) and not awkward (like the leak sealing game). I mentioned earlier that Kinect likes to embarrass you in public. The way the current set of games do this is by taking pictures of the player and showing them to you afterwards, asking if you’d like to share them with your friends (!) In fact, the games we tried deliberately set up stupid moves for you just so they could take pictures at exactly that point. How mean is that!?? Anyone else tried the Kinect? What did you think? I enjoyed writing a series of Gaming News posts on Sundays through the latter half of 2010, but did become very aware of how the gaming news cycles work and how non-news (like whatever random musings Michael Pachter pulls out of his hat) end up becoming headlines. So I’m going to try to focus this year on stories that are actually news or have some interesting commentary that relates to current gaming news. Feel free to send me links during the week if you see anything you’d like to suggest! All contributions will be attributed. Winner by quite a high amount, with a total 39% of the vote was ToME so if you are a fan of the genre and want to see what’s hot at the moment, go check it out. It’s F2P of course. No, wait, I mean it’s freeware, you can play for free and if you like the game and want to support it, you can donate. According to Steve Ballmer (Microsoft’s CEO), they have shipped 8 million Kinect units so far. Winextra (the link above) do some figure checking and conclude that MSoft have actually sold 2.5 million units, the 8 million figure is the number that they have shipped to suppliers (figures for how many of those have sold are not actually in yet, they might all have done). In any case, this is an astounding figure for a controller which is still not very well supported with games and requires a large amount of room space to even set up. I’m still hoping to see someone take a shot (sic) at making a Kinect based shooter, I think out of all the current genres that would benefit from being able to drop the controller, it’s sports/ dance games, FPS and ‘point and click’ adventure games that would benefit the most. But really the ball is in the developers’ court at the moment. There are probably some awesome things that could be done with it, as soon as people can imagine them. And my gut feel is that the biggest Kinect application, in the end, will not actually be a game. Maybe it’ll just be people using it for controlling the TV, maybe Kinect Avatar will spark off a whole new slew of virtual world mania, but this way of interacting with technology is only going to grow and spread. However, I still find it creepy to think that my computer might be watching me. It’s bad enough with the cat. One thing you will notice if you read professional gaming blogs/ sites is that there’s a strange cosy relationship that they sometimes have with developers. I’m not sure at what point money changes hands, but this is why you’ll see exclusive interviews, screenshots etc on sites that you normally would not touch with a bargepole (Ten Ton Hammer with your annoying popups, I’m looking at you). The guys at Rock Paper Shotgun went head to head with this culture this week when they published exclusive screenshots from another site WITH ATTRIBUTION and got threatened with legal action for their pains. It’s certainly tedious for readers to be directed all around the houses for information rather than just being able to pick it up from their favourite news feed. In fact, I’d rather be able to pick up my gaming news straight from the official site and my pet bug is developers (Mythic used to do this a LOT) who publish all their news as exclusives on random news sites rather than on their own. In an interview with Ten Ton Hammer (podcast interview, no transcript), LOTRO’s executive producer reports that revenues on the game have tripled since it went F2P. That’s great news for Turbine, and it’s unlikely that we’ll see any figures from Codemasters to be able to compare the EU numbers (or see how much of an advantage Turbine had from launching their version several weeks in advance). So we can assume that they’ll continue to do whatever they are doing. More bizarrely marked horses for all! Perhaps not such a great result for players who don’t particularly want to be spammed with inducements to check out the cash shop, especially if they are already paying by subscription. Rage Quit Jane offers another analysis of F2P players, “Thanks Suckers” (for buying expensive shiny cosmetic stuff for real money and keeping the game going). The bloodsuckers she’s talking about are the new EQ2 race which is being sold at a premium to people who want one now, and will be offered free to subscribers in a couple of months time. Or maybe she’s just talking about SOE. A couple of pre-order deals that made my radar this week are the slew of Rift pre-order special deals, and Dragon Age 2 announcing a DLC which is included free if you pre-order the signature edition – ie. only if you PRE-order, as opposed to last time where you got the DLC free if you bought a copy that wasn’t second hand. Hawley ponders on this trend in more detail, nostalgic for a time when you could just go buy the damned game and not feel that you have to check every possible pre-order combo to make sure you got the best deal. I think this is one of the downsides of F2P. Not everyone enjoys the process of shopping or having to waste brain cycles figuring out how to get the best deal on something commodity based like a game or book or film. Whilst it leaves a gap in the market for blogs or websites that can do the analysis for you, it isn’t really fun. Obviously for studios it’s all about the bottom line, but I wonder if making a simple process (buy box and play/ log in and play) into one that involves complicated buying decisions is really a good thing. I mentioned a week or so back that I thought there was some imbalance between ranged and melee in Cataclysm instancing. Just to show I’m not imagining it, here are a couple more authoritative views, from raiders. Paragon got the world first kill on some heroic raid boss last week (has anyone else totally lost interest in the world firsts? ), and published a note together with the kill shot on their website. Dropping out melee characters in favor of ranged ones has been a recurring theme throughout this whole raiding tier, but we hope that it’s over now with only the end bosses and Sinestra left. Here’s to hoping next tier of raiding won’t favor ranged by design. Maybe even go wild and give some incentive to bring in melee, too. Karuki at World of Ming also writes a very well written, heartfelt post about the woes of playing a melee class (Death Knight in this case) in Cataclysm heroics and raids. My experience is with heroics at the moment. And I’m getting pretty good now at staying alive *flexes at heroic Stonecore* but the cost is spending more time out of melee range and being more cautious of the mobs. Which is fine, but won’t make the numbers look good. Also an ex-guildie of mine, who is one of the finest melee dps players I know, isn’t pleased with how dps warriors are working out at the moment. So that’s something to look forwards to. Out of all the reactions I’ve read about Rift and the Rift beta/s, these two caught my eye. Caveat: I think it’s a very fun game. Abalieno @ The Cesspit sees connections between Rift and Warhammer Online, in terms of the game engine, the programmers, and other themes, and doesn’t think Rift compares well. Wolfshead writes about how he thinks combat in Rift could be improved. I don’t think there’s even a remote chance that they’ll redo the combat system at this stage in beta, and it’s not broken in any case. But I really enjoyed his analysis of how combat is the main way we communicate with the game world in MMOs these days. And one of the reasons I stick with WoW and keep coming back to it is that underneath everything, Blizzard made the basic combat experience very snappy and fun. PvD is wondering though whether some of the WoW classes/ specs are edging a little close to each other in play style these days. EA held an investor call this week and although I have summarised the main points of note below, it is instructive as to how most mainstream news blogs deal with new stories. A single investor call from the CEO was chopped up and served as multiple different news stories, one point in each. But they’re mostly based on various points made in the same presentation. It’s really very different from the way the regular news is shown (I think I’d kick the BBC if they tried to report news this way) where usually there’s one main news stories and then some associated commentary to fill up the extra slots. “If you look at Star Wars from EA and BioWare, they estimated a development budget of over $100m,” he explained. And speaking of Star Wars: The Old Republic you’d like to vote on the new name for the Jedi Wizard, place your mark here. It’s a fairytale story of geek meets geek king, impresses king with knowledge of obscure law, and wins a kingdom. OK, not a fairytale story although you wouldn’t really know that from the way people are spinning it. Red Shirt guy distinguished himself by showing up at the Q&A session at Blizzcon (in a red shirt, yes) and asking a lore question that caught out Chris Metzen, Blizzard’s lore supremo. I haven’t followed the story to a great extent after that but there were some videos on youtube, and Blizzard fixed the lore problem and also included a red shirt dwarf guy NPC in Cataclysm as a nod to the guy. Blacksen and his guild also decided that they’d like to do something nice for him so invited him to come raid with them and pick up a very nice and very lore-inspired mount in ICC. Oh, and he also has Aspergers. This week also saw the launch of the Xbox Kinect controller, which allows a user to control a game by gesturing and moving around, rather than by using a manual controller. Destructoid review Kinect, with answers to all your questions about ‘how much room do you actually need.’ I have also seen a report that Kinect has some issues with face recognition on dark skinned users (but I’d be astounded if they hadn’t tested that thoroughly before going live, because the PR would be pretty awful if that’s true.) It does highlight one of the difficulties with testing face recognition and voice recognition software – you need to test against a very wide range of faces, accents etc. so as not to be accidentally racist. Kotaku review a bunch of launch titles here. In an interview with Gamasutra, a spokesman claims that Kinect is going to outsell the iPad, and Microsoft commented elsewhere that they are forecasting 5 million sales this year. EA announced this week that they had a strong quarter and halved their losses compared with Q2 last year. Of course, they had a lot fewer sales as well and this is likely due to their current strategy of releasing fewer but ‘stronger’ games. Recently released Medal of Honor also apparently picked up 2 million sales in the first two weeks. There’s also a slightly mismatched message coming out of EA about that game. One of their VPs said that MoH didn’t meet their quality expectations. Riccitello on the other hand said that it was a clear success and likely to become another franchise. 2 million sales is hardly a failure in anyone’s book, but still the game will likely be blown away by Black Ops which is due for release next week. In F2P FPS news, EA also announced that they plan a PC Battlefield game that will be free to play. It is to be gritty and realistic. It sounds as though there will be some progression elements (learn skills, buy equipment and weapons) as well as the usual battleground gameplay. If you think it sounds a bit MMOish, so do they. This is more about you jumping in with 32 players, maybe playing against strangers, a bit more of an RPG experience, more of an MMO way of approaching things. If you like the sound of that, you can sign up for the beta here. Other EA related news this week is that they apparently now have an agreement with Facebook to use Facebook Credits for virtual transactions in their FB games for the next 5 years. There was a time a few months ago when people were actually excited about a Lego Universe MMO. Then Minecraft came out and players realised that it provided all the building block related gameplay anyone would want without the annoying MMO Conventions. Right? In any case, Lego Universe MMO went live a couple of weeks ago and the reviews are trickling in, it doesn’t sound as though it’s quite there yet. I do very much suspect that Minecraft has sucked in many of the adult players who were intrigued by the idea of a building block world. This is a story to warm the cockles of any computer scientist’s heart. It came from slashdot, which linked to Louis Brandy, a compsci blogger who explains how someone else was able to use a genetic algorithm to calculate optimal SC2 build orders for the zerg. If you’d rather read this in English, RPS have a summary here. It’s pretty cool that the game strategy in SC2 is deep enough that this type of approach throws up some interesting new ideas. I don’t in any way think that knowing some great build orders makes the game faceroll, that’s crazy. Chess Grand Masters still beat chess computers too … for now at least. Another quiet week, this time featuring a selection of bad news. 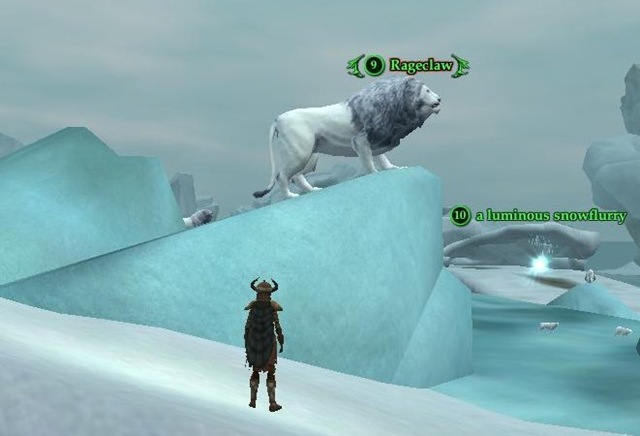 The EQ2X open beta is also in progress at the moment. Anyone trying that? I made a cool half elf guardian called Spinks and am quite liking New Halas. The streaming works like a dream – it’s a very fast install indeed and gets you into the game almost immediately. The EQ2 devs are still in love with the zone design that sends you out from your quest hub to the same group of mobs about 5 different times in a row. It’s also very lonely when you can’t actually access any chat channels. And call me old fashioned but I think that plate mail should look like plate. I don’t see this as a long term diversion. Player vs Developer (who has been on a roll this week, go check his blog) has written a thoughtful post discussing all the EQ2X free to play restrictions. Earlier this year, Acclaim was bought by social gaming company Playdom. This week it was announced that they have shut down all of their games. I don’t pretend to understand the thinking behind buying a developer and then shutting down all of their games unless they were costing too much to run and the actual developers are needed to work on new projects. 9dragons may have escaped the cull. The North American license has been bought by GamersFirst. Presumably more news about what they plan to do with servers will be forthcoming. In what must be a blow to Google’s gaming plans, their games boss has left after just four months in post. He commented that Google wasn’t the perfect fit for him, which could mean anything really. Frankly, all copyright and patent suits are opportunistic. There’s no point going to all the hassle and expense of suing someone unless there’s some money in the property. And since Zynga have made their fortune by hijacking other people’s game ideas, it’s ironic to hear them complaining about it now. Is it evil to buy used games? THQ complained this week that when gamers buy used games, they are cheating developers out of their rightful profits. The Penny Arcade crew jumped in and agreed that they were uncomfortable with the used market. And then there was a storm on the blogosphere. Personally to me this comes down to ownership. Once I own an item, then I can do with it as I wish, including selling it in the second hand market once I am finished with it. This is very different from piracy (which involves making unlicenced copies and selling those.) You also don’t see authors complaining about libraries – quite the opposite – although no author ever got rich from borrowing fees. Having said that, if companies wish to charge for providing online services then it seems perfectly reasonable for them to do so. Just once you have decided what to charge, you don’t get to double dip. It’s another mark in favour of subscription service, in fact. Although it’s against the EULA to sell accounts in most sub MMOs, at the end of the day the developer is still getting monthly fees from someone. F2P has an even more chilled model. They actively want everyone to play for free so that they can entice them to use the cash shop. So perhaps the flaw is with the charging model which requires players to put down a large amount of money up-front for a game they haven’t yet had a chance to play. There were some mixed messages this week about whether Kinect will feature voice control or not. The upshot is that Microsoft claim that it will – at least for English. 4.5 days of insane geekery is over and done for another year for me, as I lie in my hotel bed thinking about yesterday’s events. Sundays tend to be a bit lighter than other full days at Comic Con, mostly because people are planning to and heading home. But the streets are still packed and the convention center even more so. My day started very early when I read a tweet from a friend suggesting that the line to get into the center had started before 2am and that they were freezing and needed coffee. So, around 5am I headed down to the line, with orange juice, a blanket and coffee to deliver, and then took my place at the end of the line, which was a good bit longer than for any other day. I should explain the queues, actually. Before the building opens in the morning there are two queues outside; one for Hall H and one for everything else. Hall H is the 6500 seater room where the big studios do their big presentations, and people traditionally queue a while to get in, but often you can turn up at a far more sensible time and still get in the room. We queued overnight for TRON but could have showed up at 6am and still been fine, but in the back. It all depends what’s in Hall H.
The Harry Potter presentation had the longest queue this year, unsurprisingly – but it still wasn’t as crazy as either Twilight or Lost from last year. So, there was no programming in Hall H this sunday, so forget that line. The other queue is to get to everything else! That’s Ballroom 20 (second biggest room), the exhibit hall (to queue up for exclusives or nab especially nice swag) and then every other programming room. So it’s a huge queue also, but last year I never noticed, because I didn’t once queue outside for the general opening last year. This year was a bit different as a few panels I wanted to catch were hugely popular and first thing, and hell, I was awake so I wandered down. And the line this sunday was the longest one I’d been in for just general opening – why? Well, final day for the exhibit hall, coupled with Ballroom 20 programming of Smallville (final year), Supernatural (final year, perhaps), and after a gap, Glee. So three pretty popular shows. The main star of Smallville, Tom Welling, only came to Comic Con for the first time last year, and that was only leaked the night before. This year fans have known for months, so there were a TON of them. For me, Supernatural was the focus as all four leads were there, whereas last year the two main chars hadn’t made it. And I knew I couldn’t stay for Glee if I wanted to say a proper farewell to my Con buddy, which I did. So a light day panel-wise of just Smallville and Supernatural. Smallville was kind of cool, it got a great reception and they always sell the show well, but I simply don’t watch it. There was a lot less asking the cast for autographs this year, and better questions – about what they’d do next, their favourite episode, etc etc. Once it was done though, the party really started with a sneak peek at episode 4 of the new series of Supernatural – and it was /electric/. Directed by Jensen Ackles it’s a Bobby-focussed story that brings Crowley back and looks fantastic. The rest of the cast then emerged to talk post-Apocalyptic Supernatural, and it was good-natured and hilarious, but also fans didn’t ask trite questions too much, which was nice. Jensen talked a bit about directing and killing vampires, Eric Kripke smacked down M Night ‘Douchey’, and Misha Collins.. well, was just ridiculously funny AND good-looking. Ha ha, I know, already, I’m usually serious, but I have a crush 🙂 My favourite Supernatural TV critic has put her thoughts and the full audio of the panel here – she sums it up perfectly, and I’m tired! And with that Comic Con 2010 was done for me. Still the streets were crowded. We had lunch and I waved off my friend as he got his cab to the airport (when he checked out we were standing next to James Marsters, for a last little geek-out moment). I braved the world and got a trolley up to Fashion Valley mall to go check out the Apple store for an iPad camera connector. The trolley ride was fun, the Apple Store not so much, with chaotic and REALLY unhelpful staff. I actually hated it, and decided I’m only ever shopping from Apple online if that’s how ridiculous, rude and ill-informed they are. I literally got shunted around 6-7 staff before overhearing an EIGHTH say they had none of those items. The others just sent me on a run-around, so in disgust I wandered to the Microsoft Store to watch Kinect being demoed. Actually, as a cynic, it looked kind of fun – though obviously their set-up in terms of space and room was optimal. As with anything it’ll depend on the software they bring out for it and how compelling it is. Irrelevant to me as I have no console! And no space in my living room thanks to an enormous coffee table. It’s over, though, and I had another great time. So here’s the info people asked for last year. The 4-day Comic Con pass cost me $100 (next year was being sold for $105). They only do a certain number with the preview night, and someone said those had sold out already, but I can’t remember if last year they put up more preview night tickets when they opened online sales. Online sales WILL start soon though, so keep an eye out. Preview night isn’t THAT remarkable, but it’s a nice way to check things out with a slightly smaller crowd and no panels – it’s basically some TV previews, and the exhibit hall. And you CAN buy a 4-day pass without it. Um, my flight to the US cost £560 flying into Chicago and out of San Diego, but it would have been around the same for direct flights to San Diego. The train trip from Chicago to San Diego was $172 for the train ticket plus $150 for the room on the train ($295 for the room, but split between the two of us) and that included all meals on the train. Hotels in San Diego are pretty pricey, so I’m not going to break down that cost for you, but having used the trolley service ($15 for 4 days travel or $5/day) I’d not be averse to staying outside of the centre – though, I have to say I have enjoyed the luxury of a nearby hotel the past two years. And no, I didn’t get a ticket for next year, I think I want to branch out and try PAX or DragonCon or Gamescon in Germany.. before returning to a Comic Con.